As children grow in maturity from preschool to elementary school, many parents begin to think about introducing their kids to the responsibility of a pet. Fish are a popular first choice, as they have a relatively low startup cost and low maintenance compared to a dog or cat. That first fish is often a free goldfish from the fair, or a pretty betta their child fell in love with at the store. I’m an avid aquarium keeper myself, and fish can be truly wonderful pets. Studies show that looking at fish can reduce stress levels, and successfully keeping fish can provide a valuable science lesson in water chemistry, aquatic ecosystems, and the nitrogen cycle. However, those lessons can only be taught when fish are kept correctly. Otherwise, a child’s first introduction to responsible pet keeping often ends in wondering why their betta magically changes colors and sizes every week, or an empty tank and a story about how their fish went to live in a lake where it’s much happier now. Pet stores often advertise starter kits for beginner aquariums that are conveniently tiny—such as a 1g bowl with a built in light and a few fake plants. However, it’s best to stay away from those kits. While they do sit nicely on a dresser or bookshelf, the fact of the matter is that keeping any fish in 1g of still water really isn’t enough. While it’s possible for some fish to survive in so little space, it’s akin to locking a human in a bathroom and feeding them through a tray under the door. Yes, the human could survive, stand up, turn around, and have water to drink and enough to eat. But it’s not a great way to live, and your lifespan in that environment will be much shorter than it could have been. Just because some fish can survive in a smaller space doesn’t mean its kind to keep them there, and keeping a pet improperly for the sake of space and convenience kind of defeats the purpose of teaching kids responsibility. Let’s look at a proper aquarium setup for a betta and an improper one. As you can see, the proper setup is beautiful, and has a few specific things going on. There is enough water to keep the fish healthy and happy (in this case, 5 gallons), and a bright light that supports the growing of aquatic plants. Aquatic snails (which aren’t visible in this view) clean up extra food and fallen plant leaves. There is also a filtration system to keep the water moving, which both aerates it and cleans it. Nitrogen cycling bacteria live in the rock gravel, as well as in the filter. They eat the waste and turn it into fertilizer for the plants. This setup requires very little maintenance, and the fish will live a long and happy life. This is what too often happens with a child’s first fish. There isn’t enough space for the fish to be comfortable and happy. Because there isn’t a filter or water movement, the waste accumulates in the tank without nitrogen cycling bacteria to take care of it. No live plants or scavengers can help cycle the waste either. The poor quality will pave way for the fish to get sick, and likely die. Fish, in general, need a few things in their environment to be happy. 1) Space. The smallest space for a betta that isn’t going to slowly torture your fish is 2.5g. However, 5g or more is preferred. Goldfish, on the other hand, produce a LOT of waste and can grow to be quite large. I often hear 20g as the smallest tank size recommended for a single goldfish! If you plan on keeping more than one fish together, a very very rough rule is 1 gallon per inch of fish’s body length. So you could theoretically keep up to 10 small fish in a 10 gallon, but only 5 medium sized fish. Of course, there are compounding factors like aggressive fish needing more space than that, or how a single 10-inch fish in a 10-gallon wouldn’t have enough space to turn around. It’s always best to do your research on individual species of fish and their respective needs before you purchase one. I personally use a Fluval Spec V. for a starter fish tank. I had to shove a small piece of sponge in the filter output to make the water slow enough for my betta, but he loves it. Without slowing the filter output, his long fins would get caught in the current and he would have a hard time swimming. Smaller fish, like a school of 5 neon tetras or guppies, would be fine in the current. 2) Aerated water. There are a few fish that can breathe from the surface, such as bettas, goldfish, and guppies. Most other kinds of fish would die without aerated water. To aerate water, you can either have a bubbler running, or have a filter that moves the surface of the water enough to successfully aerate it, much like the water would move in a gentle stream. And even surface-breathing fish like bettas, goldfish, and guppies prefer water that is aerated. Unless your tank is in a sunlit window, you will need a light source. Some small tanks come with a LED lamp, which is fine to use. You can also buy lighting fixtures like these to fit your tank. 3) Temperature control. Fish are from all over the world, and different bodies of water have vastly different climates. A fish from the Amazon will prefer warmer water than a fish native to the Great Lakes, for example. You can buy aquarium thermostats rated for however many gallons your tank is, and aquarium thermometers to keep an eye on the temperature. 4) Clean water. Fish are dirty. They expel their waste directly into the water they’re swimming in. Any food they don’t get to will fall to the bottom and rot. Extra waste and rotting food produces ammonia, which will hurt and possibly even kill your fish. The very first steps to clean water are to make sure you aren’t overfeeding (if there is leftover food after two minutes, there is too much) and making sure you aren’t crowding your fish. If there are too many fish in your tank, your filters won’t be able to keep up with the waste produced and they will get sick. Clean water is a two-fold process, achieved by water changes and running a tank filter. It’s generally recommended to drain around ¼ of the tank’s water every week, and replace it with dechlorinated, temperature-matched water. You can drain the water with a clean siphon and a bucket. NEVER clean anything from the tank with soap, as the residue will kill the fish. Before pouring new water into the tank, it’s very important to dechlorinate the water with a product like Seachem Prime and make sure it is the same temperature as the water you removed, because both chlorine and rapid temperature changes can kill your fish. The second part to having clean water is running a filter. In it’s most basic form, a filter will circulate the water in the tank to aerate it, and have some kind of floss or sponge to catch debris. However, that alone isn’t enough to keep the water clean. If you want to change your water less often, you can set up a biological filter and build an ecosystem. After all, in many natural bodies of water, there isn’t weekly water replacement going on. What happens there is a balance between the fish, nitrogen cycling bacteria, decomposers and detritivores, and aquatic plants. When fish produce waste, nitrogen cycling bacteria and detritovores break it down and convert it into non-toxic forms. This is then used as fertilizer by aquatic plants, which clean and oxygenate the water. In my own aquariums, I achieve this balance by making sure to have live aquatic plants, shrimp and snails, and a filter full of nitrogen cycling bacteria. The bacteria live on the tank’s gravel and in porus ceramic beads inside my filter, and all tank water passes through them so the bacteria have a chance to chow down on the fish’s waste. Snails and shrimp eat any dead leaves that fall off a plant, and take care of any extra food that the fish drops. The plants feed off the end products of nitrogen cycling, and the fish can hide in the leaves of the plant. Everybody is happy, I test the water regularly to make sure the water is still clean, and only actually need change it every month or so. To get the nitrogen cycling bacteria to live in your tank, it’s important to let the tank run for a few weeks before putting your fish in. The first day your tank is running, put a pinch of food in to rot. As it rots, the bacteria that consume the rotting food will multiply and colonize your filter. To make sure you have clean water, you must test it regularly and watch out for any sign of your fish’s distress. In a water test kit, it should show 0ppm ammonia, whichever pH your fish is/are adapted to, 0ppm nitrites, and around 10ppm nitrates. I use the API Test Kit personally. If the numbers ever stray from this, you should change some of the water, and possibly add aquarium chemicals to absorb or change any harmful chemicals. For example, seachem prime (the chemical I use to dechlorinate my water) can also be used to remove high nitrates. 5) Keep your fish healthy. If you ever notice that your fish is acting strangely, such as lethargy, rapid gill movement, spending too much time at the surface or at the bottom, frantic movements, etc. it’s often a sign that the water needs to be changed. Change 50% or more with fresh water and see if your fish’s symptoms improve. There are also several fish diseases and parasites that can affect aquarium fish. All infections are more likely in fish that are stressed out due to limited space and poor water conditions. Here is a good list of aquarium diseases to watch out for. and their treatments. Notable ones are fungus, fin rot, and ich. It’s very important to treat diseases promptly and correctly, or else your fish will likely die. Fish medications are available at pet stores and on the internet. 6) Recognizing good tank mates. Not all fish will get along, even if they are kept together at the pet store. Sometimes, even fish of the same species might not get along with each other. Bettas are notorious bullies, and two bettas kept together will usually fight to the death. It’s important to research which kinds of fish you plan on getting before you purchase them. For example, neon tetras are Angelfish’s natural prey in the Amazon, and if you keep them together, you might wake up one day to find a massacre. Some fish are very territorial, and will attack others that get too close. On the other hand, some fish need company and will be lonely and depressed if they are kept alone. Particularly, schooling fish often need groups of 5+ to be happy, and you will need a tank large enough to accommodate that many fish. Tetras are a very popular type of schooling fish that are easy for beginners. Research the water conditions of every fish you plan on getting to make sure they are compatible, and if you keep fish together that come from incompatible environments, one of them will probably die. While the person working at the fish store might know which fish can be kept together, it’s important to also do your own research to confirm what you are told. Many people working in pet stores are unfortunately misinformed about which fish can peacefully coexist. 7) Knowing when a fish is too much responsibility. 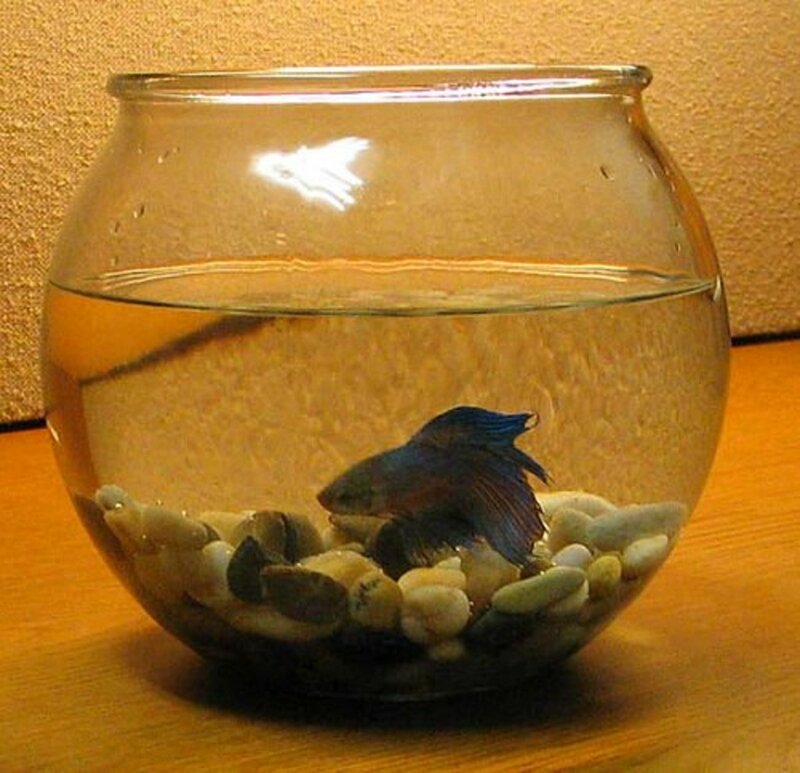 A lot of people get their first fish assuming that all it will need is a bowl and some food. If you aren’t prepared to put in the extra work to give a fish what it really needs, it might be best to hold off on getting a fish or pet. Likewise, some parents get a first pet with the assumption that their child will be 100% responsible for taking care of it. I would caution against this attitude, as very few children are actually responsible enough to put in all the necessary work. If the parents aren’t prepared to step up and take over when their child skips a water change, forgets to feed their fish, (or forgets to walk the dog or clean up after it), it’s the animal that suffers. And that isn’t fair. If you bring a pet into your house, do it with the full awareness that you might very well be the one taking care of it, or have a safe option to re-home the pet (even if it is just a fish) to a home that will provide the necessary care. When you take on an animal of any kind, you are responsible for its welfare both in your home and if it leaves. If you do decide that keeping the fish isn’t the right decision for your family, make sure to NEVER release a fish, snails, shrimp, or plants into the local waterways. A nearby pond or stream might seem like the perfect place for your fish to live out it’s life, but it’s really not. If the fish isn’t native to that environment, it will likely either die or become invasive. In fact, many states will ban the sale of many common aquarium fish (such as dojo loaches) because too many were released into the local water, which destroyed the natural ecosystems. The best place for an unwanted fish is with a new family that is equipped to take care of it. The second best place is back to the petstore, where many will take the fish back as a return, or as an animal surrender. By responsibly rehoming an unwanted fish, you’ll ensure that the fish has a chance at a happy life, and the local ecosystems will be protected from non-native species. And importantly, you child can learn a valuable lesson about showing maturity in the face of recognizing when a situation isn’t a good fit for a particular family. 8) Enjoy your fish. Fish are truly amazing creatures, and are full of learning experiences for children! Many fish have clear personalities and preferences, and new research shows that they can recognize individual human faces–far from the 5 second memories we long assumed they had. Watching fish grow and develop can be a wonderful experience for children and adults alike. Regardless of which fish you choose, research it/them and teach your children about their natural environment and behavior. For some examples of teaching points, many fish are very colorful so they can attract mates. Male Bettas build bubble nests out of saliva-covered bubbles so they can take care of eggs. Males are the one to watch over the baby bettas, while the females go off somewhere else. Guppies are one of the few fish that have live babies instead of laying eggs. Catfish have whiskers so they can stir up the bottom of their area to better find food. Ghost Knife fish can sense electric fields, and use that to hunt prey! You can also tie lessons about your own home aquarium to natural aquatic ecosystems. Take trips to local aquariums and to lakes, rivers, and tide pools. Point out to your children which processes are the same in your aquarium, and which ones are different. And of course, talk with your kids about the importance of preserving aquatic ecosystems. From overfishing to pollution to global warming, the health of our lakes, rivers, and oceans is one of the most important lessons for young kids to learn about. And there’s no better place to teach this than teaching them to care for their own home aquarium.